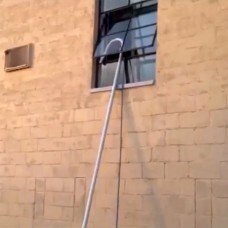 The Goose Neck Hook is a tool for you if you do second and third floor cleaning with a truck-mounted machine. This lightweight tool can save you time as well as tiring trips up and down the steps, while increasing the efficiency of your equipment. It’s so easy to use--just snap your solution hose to the neck, hook it on the windowsill or handrail, and attach your vacuum hose to the bottom. At this point you just need your wand and a section of vacuum hose--and you're cleaning! This unique tool also telescopes for third floor work, but it’s still small enough to fit in a standard van. The best part is the price--only $375.00. PLUS as an introductory offer, we will include a FREE adaptor kit that lets you hook the Goose Neck Hook to quick cuffs or a safety connect.